Bill Windsor of Lawless America asks the House and Senate Judiciary Committes to reign in the out of control judiciary. Bill Windsor calls for publc hearings. 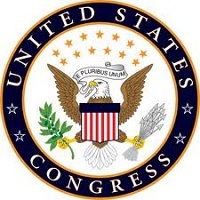 Bill Windsor has requested meetings with the House and Senate Judiciary Committees during Meet Me in DC, February 5-6, 2013 in Washington, DC. Congress will be presented with horrendous cases of judicial abuse and corruption. Will Congress ignore this as they usually do? Over the past year, Lawless America has traveled the country filming people who have been harmed by corruption in our courts. Upon compiling thousands of video testimonials from citizens from all across the United States for a documentary film, it has become apparent that the Constitution and laws written by the Legislative Branch are being disregarded by the Judicial Branch of government. This rampant disregard for the laws is captured in the video testimonials from every state in the nation. The evidence is overwhelming. Compliance with the Rule of Law and the Constitution are not even considerations within countless judicial proceedings all across the United States. Blatant and often collusive abuses of power by these government officials to dictate outcomes of people’s lives unjustly, makes this a crisis situation. Legislative representatives who have been elected by the People, and empowered to write the laws, can serve no purpose when the Judicial Branch ignores these laws. The problem can only be solved by the leaders in the U.S. House of Representatives and U.S. Senate recognizing these unconstitutional acts by the Judicial Branch, then calling upon the legislature’s delegated powers to terminate these abusive practices. Congressional leadership must work citizens to identify these abuses of power and implement procedures that reverse the damages. Measures implemented by the legislature to assure accountability within the Judicial Branch will curtail these travesties of justice. Congress, working together with the People, can restore a legitimate government that complies with the Constitution and assures a legal system that applies the Rules of Law. 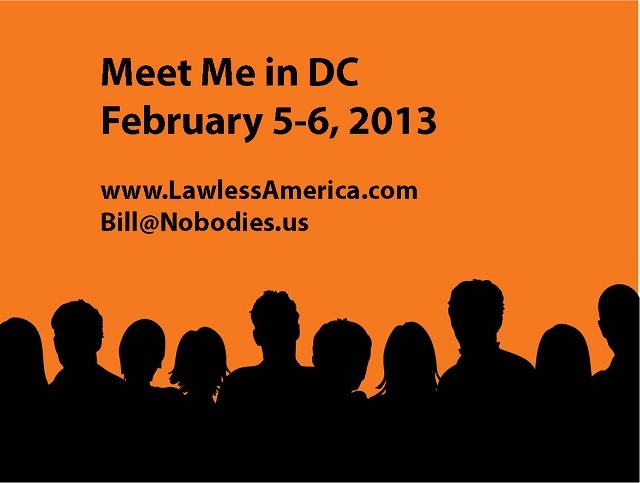 On February 5th and 6th, Lawless America is holding a caucus in Washington, DC. The purpose of holding it in DC is so citizens may explain the vast problem to their legislators in person, while requesting action be taken to reign in a branch of government that is clearly out of control, the Judicial Branch. We have prepared abbreviated video presentations of horrendous cases that have devastated the lives of people by unlawful judicial proceedings. Our intent is to show you what is occurring all across the country and why U.S. Congressional public hearings are the most effective means to implement the change required. Congressional committees working with the People to prepare a series of Congressional public hearings on this critical issue are the most effective utilization of resources possible. Public hearing must be held in the appropriate subcommittees within the House and Senate Judiciary Committees and Homeland Security/Government Accountability Committees as soon as possible. The Congressional public hearings and live testimonies are needed for decision makers to obtain the information required to identify these abuses and to implement effective solutions that will restore a legitimate government in accordance with laws established by the Legislative Branch. Lawless America will do everything possible to aid Congress to make the public hearings a success for the purpose of restoring a valid government. There are measures which may be taken prior to February 6, 2013 to aid concise, effective communication during our scheduled meeting. Please have your Legislative Scheduler contact me to discuss our planned presentation to you and to schedule an appointment at your office on February 6, 2013, or on February 6, 2013 at the Rayburn Office Building Room 2103 between 11:00 AM and 12:00 PM while we are in DC for the Lawless America caucus. Your prompt attention to these matters is greatly appreciated.